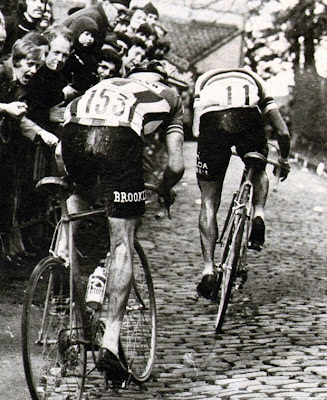 The C word: Cycling's essential element. Last month , I posted a 'wee rant', taking a poke at the advent of 'halo bikes,' and their skyrocketing super-premium prices. It surprisingly spawned exponentially way more traffic to our little wielercafe than any other topic posted since its inception. Picked up by a few forums, the debate kept going for quite awhile. Learned something. People love to talk about the bike. And that for many, their top-level bike is it's a sacrifice they're happy to make, a hard-earned possession, and their true passion. Challenge it at your peril! Fair enough. Many who love cycling express that with a real passion for the best cycling technology, and really get joy from it. Thankfully a high-end bicycle is one 'luxury' where the absolute best is still an accessible stretch for many who really, really want it. Cold, but not frigid today. 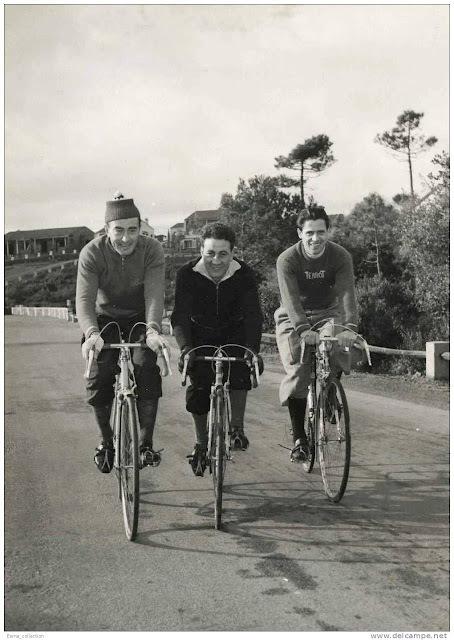 Kind of like this day over 60 years ago, when this photo of Louison Bobet training with Antonin Rolland (rt.) was taken. Hands on the tops, spinning side by side, smiles all around. All the essential ingredients for the perfect winter training spin. 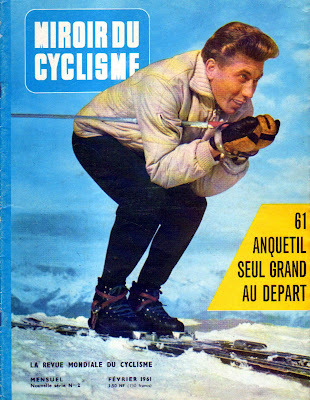 You've just gotta love the sixties-seventies when it came to pro cycling sponsorship. No multi-million dollar budgets then jongen. In those days, pro cycling title sponsors tended to be, well, a little more provincial. Back then, refrigerator and kitchen manufacturers (Ignis, Salvarani, Frimatic, SCIC, Fagor) - for some reason I'm not too sure of - were really big supporters. Then there were the ice cream men (Miko, GIS, Sanson, Sammontana), beverage magnates (KAS, Pepsi, St. Raphael, Watneys, Maes Pils), and household consumer packaged goods brands (Mars bars, BIC lighters, Faema espresso machines). And then there's consumer electronics, which in that pre-digital time, meant televisions and radios, tubes and transistors. 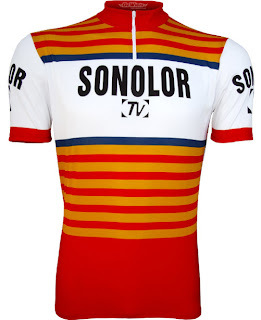 If you were a cycling fan in France or Belgium back then, there was a pretty fair chance you listened to Radio Tour in your Citroen on a Sonolor radio, or watched LeTour on Eurovision at home on a Sonolor brand TV set. For all you fellow retro-bike fans, at Velofollies show in Kortrijk, Belgium this weekend, Flandria just debuted two steel framesets: A road and a track model. Both made in Belgium from Columbus SL Niobium tubing, with chrome fork, chain stay and rear dropouts. 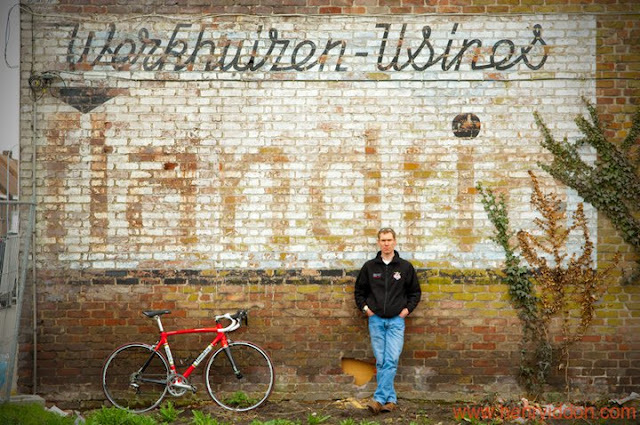 Only in flandria team red, of course! Perfect for battling over cobbles or broken urban roads. Pretty schweet. Check out more photos here. Yesterday was an 'off day', but not a rest day. Out on the pistes, just when I'd get my turns linking nicely, and feeling like Henri Duvillard or Gustavo Thoeni (giant slalom stars from my generation baybay), some guy who could really carve fast would come blowing by me, bursting my balloon and exposing me for what I am - an aged road racing cyclist trying to pass himself off as an expert downhill skier. Q: What's the biggest lie in skiing. ...relatively balmy compared to yesterday. Going out for the Fixed Gear bike for about 2 hrs dressed like I'm going on a moonwalk. "Roger, do you read me Houston? What's that coordinate equation again?" 2H (39x16) + (no lunch) - (freewheel) = Wintertrainen! Picture of the day. Maillots, mode classique. Ah yes, New Year Day. The cue for Pro Tour teams to roll out their new maillots. In case you hadn't seen it, Sporza's Michel Wuyts just put together an extension to his great TV series last year 'De Flandriens', airing weekly now on Belgian TV station CANVAS. 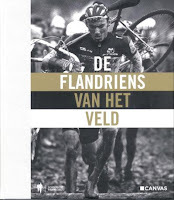 This new series - De Flandriens van het Veld - focuses on Belgium's legacy of cyclocross champions. Clip below is from a Belgian talk show previewing the series... some cool old footage. Unfortunately more segments or clips are not on the web yet... hopefully they'll put them up once the series is over.